Flamingos inhabit many countries around the world across the Americas, Africa, France, Spain, Germany, and the Middle East. The flamingo is found in tropical or subtropical climates. The specific location varies from species to species, and many species migrate for part of the year. The most widespread species of flamingo are the Greater Flamingo. This bird can be found in freshwater or saltwater, in the Caribbean seas or in the estuaries of Central and South America, or lagoons in Africa and Asia. The Greater Flamingo makes its appearance in the United States and it is only one out of three flamingo species that can be found in the United States on rare occasion. These birds or flocks are considered vagrants or wanderers. They also find a home in the Bahamas and the West Indies. The Lesser Flamingo has traveled as far north as northern Spain . The rest of the species’ population can be found in eastern and western Africa as well as parts of India. The Andean and the James’s Flamingo have a more restricted natural habitat found solely in South America. The Andean Flamingo is found in Peru, Chile, Bolivia and Argentina. The American, or Caribbean Flamingo, is also found in the United States and the islands surround the Caribbean. The flamingo needs a habitat that has shallow enough waters so that they can feed. The proper sanctuary for the flamingo has been recreated in zoos all around the world, proving acceptable for many species. Many species of flamingo thrive in captivity. The flamingo feeds standing up so the waters cannot be too high. The climates for flamingos vary around the world; some can survive in salt waters and other live in freshwaters. The favorable climate can be found in far inland lakes or swamps and even sandy islands. It is beneficial for the s species that each flamingo species feeds on a certain thing because if they all ate fish, there would be a lack of fish. The Chilean Flamingo prefers a habitat where there are no fish, because the fish turn out to be competition for their preferred diet. Other species of flamingos can live in more diverse locations than the Chilean Flamingo because of their adaptable diet – they can eat a larger variety of food like fish and crustaceans. Flamingos at Nakuru Lake, Kenya. The flamingo species that lives in high altitudes – the Andean Flamingo makes a home in the Andes Mountains – may need to travel to lower, warmer environments because of cold weather or lack of resources. They migrate as a flock and find warmer waters and more abundant resources. Flocks may have to find a new feeding ground if the water rises too high – this can make it difficult or impossible for them to feed. A drought can also seriously affect flamingo’s migratory habits. Flamingos prefer to travel at night and when they do they travel at high altitudes and fast, preferably in cloudless skies. It is possible for flocks to break-up where some migrate with other flocks and leave their original group. The Greater Flamingo for example resides typically in muddy lagoons or shallow lagoons. 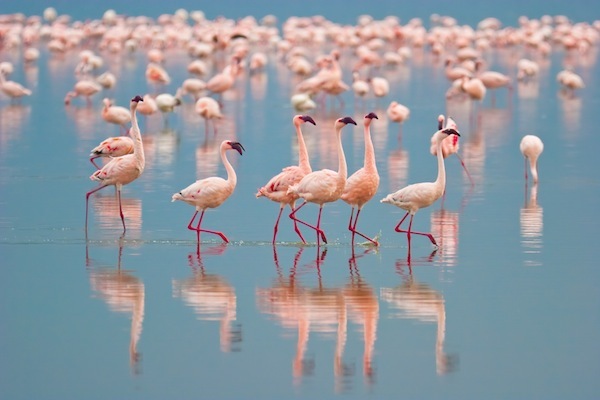 The Lesser Flamingo can reside in a completely different habitat like volcanic lakes with a pH up to 10.5. If flamingos live on this water then they need to travel to find freshwater so they can drink. The group of birds that live in Carmargue, a city in southern France, have been observed migrating to Spain or Turkey during the winter months. They also learned from studying these birds that the migratory patterns depend on the direction of the autumn winds.